A loan of $6,550 helped to purchase seeds, petrol for farming machines and hire workers during harvest time. The funds will help the group of 30 members from Kha Lout Tayar Village. The featured borrower, Tin, is 47 years old and married with four children. She is very proud that all of her children chose their careers well as teachers and computer engineers. She has thirty acres of crop farm where she and her husband work every day. As a secondary business, the family also plants nipa palms, betel leaves and sells firewood as well. The loan will help her purchase fertilizer and pay for hiring the workers to help on the farm during the harvest season. As cropping covers the family's basic costs, she is very proud of doing this even though it's very tiring sometimes. Tin and her husband plan to open a computer repair shop for the engineering son in the future, so that they would be able to cover most of the expenses. Pictured above are the CBO leaders, named Tin, Tin M, Than, Khin and San. They oversee 30 members of Kha Lout Tayar Village Group 1. With the funds, the group aims to purchase crop seeds, fertilizers and gas for cropping machines. Kha Lout Tayar Village is located in the Myanmar Ayeyarwaddy River at Delta Region and they mainly focus on crop farming. They also plant betel leaves and seasonal foods for additional income. 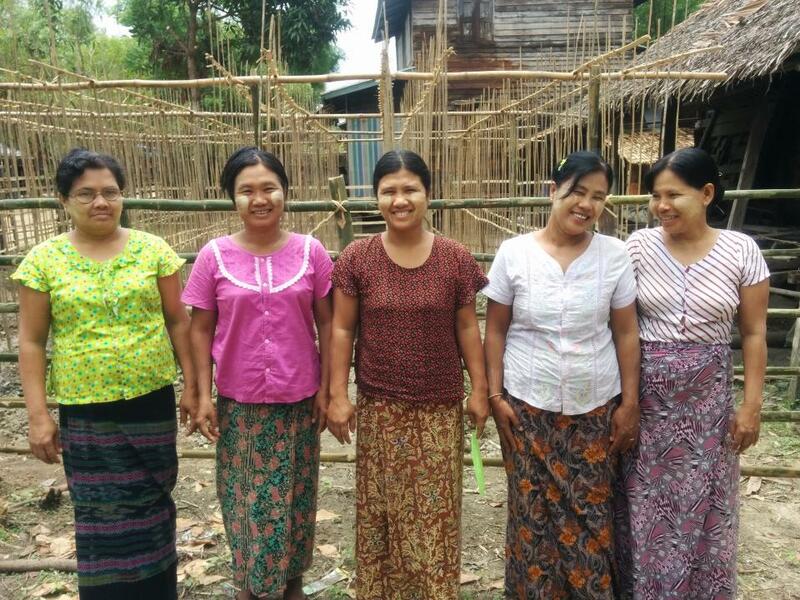 This loan will be facilitated through Proximity's network of Village Lending Groups (VLG) to connect with rural farmers in Myanmar’s Delta and Dry Zone regions. Proximity works closely with the leaders of these village groups who assist the loan officers through the entire loan cycle, are borrowers themselves and act as a liaison between villagers and Proximity borrowers. Since farming families often rely heavily on income from the harvest to support their livelihoods, this loan is structured with a single repayment at the end of the loan term. The timing aligns with the harvest season when borrowers have the ability to repay. All community members who receive financing through the VLG model must repay their portion of the loan before any group members will be eligible to receive new funding. Proximity Finance is the financial services unit of Proximity Designs, a non-profit social enterprise, established in Myanmar in 2004 to provide affordable irrigation products to smallholder farmers. Proximity Finance was set up in 2012 to offer working capital microloans to help these farmers increase their productivity and income. There are around 12 million smallholder farmers in Myanmar, the majority of whom don't have access to sufficient affordable credit to meet their working capital needs. In the absence of other financing opportunities, most of these farmers are unable to purchase the optimal level of inputs to achieve sufficient crop yields. As a result, farm productivity in Myanmar is lower than in any other parts of Southeast Asia. Kiva funding will be used to help Proximity Finance expand its agricultural microfinance operations to new territories, and over time to expand its range of innovative, affordable financial services tailored to the needs of rural people. Proximity’s mantra is “Innovation in Collaboration.” Join Proximity's lending team or view their website to learn more about their impactful work. Kiva supports Proximity Designs’ mission to provide loan services to small rural farmers who do not have access to traditional credit services. In the absence of other financing opportunities, most small farmers in Myanmar are unable to afford the equipment, material, and labor necessary to grow their crop yields. Kiva funding is used to help Proximity Designs expand its agricultural microfinance operation and reach more low income, rural farmers.